Available in 25, 28, 32 and 36 inch diameters, Reltech's PREMIUM PF Series fibreglass sand filters are built for the toughest applications. Suitable for use with Reltech's Ecoflo Glass media, Zelbrite or standard filter sand, the PF Series guarantees crystal clear water with minimal ongoing maintenance. All PF Series filter multi-port valves incorporate a large "palm-action" handle for silky smooth, easy operation. 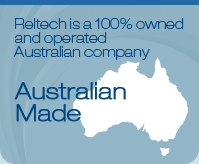 Available in 320, 420 and 520 square feet models, Reltech's PREMIUM PEN Series, 4 cluster cartridge filters are the ultimate solution for the water conscience consumer. The PEN Series huge capacity ensure minimal maintenance and superior filtration efficiency. Available in 4 common sizes from 75 to 200 square feet, Reltech's CLARO CR cartridge filters are a cost effective solution for the water conscience consumer. Ideal for small pools, spas and water features they offer excellent filtration efficiency and minimal maintenance (if sized correctly). They are also a great solution where space is limited.